On 1-2 November 2018 NASA’s urban air mobility (UAM) vision and research roadmap were given a public airing at the NASA Urban Air Mobility Grand Challenge Industry days (https://www.unmannedairspace.info/uas-traffic-management-tenders/nasa-issues-first-urban-air-mobility-grand-challenge-industry-request/). 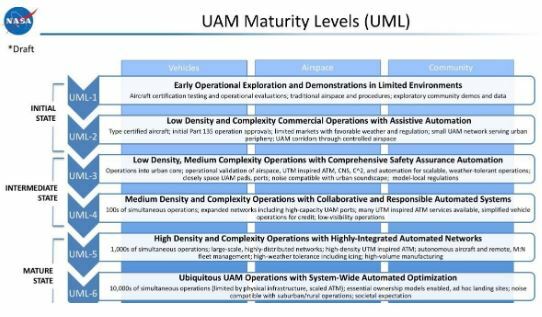 NASA unveiled its concepts for UAM maturity levels – from the initial state of early operation exploration and demonstrations in limited environments (where we are now) to a final state of ubiquitous UAM operation with System Wide Automated Optimization. NASA plans to advance progress on UAM with a series of grand challenges, with the next one (GC1) planned for January 2020 when industry partners will be asked to address the foundational airworthiness UAM vehicle design readiness and robustness for UAM operations, followed in January 2021 by GC2, which will address key safety and integration barriers. “The goal of this first in a series of UAM Grand Challenges, which we are calling GC-1, is to promote public confidence in UAM safety and facilitate community-wide learning while capturing the public’s imagination,” said NASA in a statement. At the same time NASA published its latest research findings into comparing the strengths and weaknesses of competing UAM vehicle designs. (https://ntrs.nasa.gov/archive/nasa/casi.ntrs.nasa.gov/20180006683.pdf). “The question of which aircraft type is optimally suited to performing economically viable Urban Air Mobility missions has been and will continue to be the subject of much debate. Rather than propose to identify the singular best type of vehicle (which may be determined as “best” for a non-technical and perhaps even non-economic reason), this study is considering a broad variety of types of vehicles which appear to be viable given our current understanding of UAM markets,” said the study. The quadcopter vehicle optimum for gross weight and installed power comes at a low disk loading. As a result of the low disk loading, the best endurance speed is very low, but the best-range cruise speed is actually close to other vehicles….The growth in weight due to battery propulsion is very pronounced, and the battery-powered Electric Quadrotor is 73% heavier than the Turboshaft Quadrotor. The Turboshaft Side-by-Side aircraft is the lightest weight solution among those examined here….The Electric Side-by-Side is the lightest of the battery-powered concepts, and at 41% heavier than its turboshaft analog, is in between the growth factor for the other two concepts. In the lift-plus-cruise configuration electrical power distribution allows a nearly scale-free production of lift, due to the flat scaling of weight with size of electric motors, as compared to turboshafts and reciprocating engines. Therefore, many small motors should be no heavier than few large motors. For the battery-electric aircraft, a single battery is modeled connected to all of the motors for the purposes of sizing the aircraft. Various failure modes must be considered, and topologies with multiple batteries serving all or some of themotors are also feasible; these trades will be performed in the coming months.